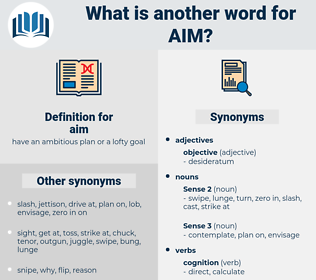 What is another word for aim? be going to do something. expectations, benchmarks, directions, weapons, Goals, covers, target, targets, uses, Shots, IAM. motives, interests, hopes, collectors, subjects, Biases, Lenses, Goals, target, targets. coordinates, Criteria, target, idea, destination, effort, perspective, direction, endeavour, finality, pursuit, commitment, meta, achievement, quest. focused, sought, Served, tried, stated, target. 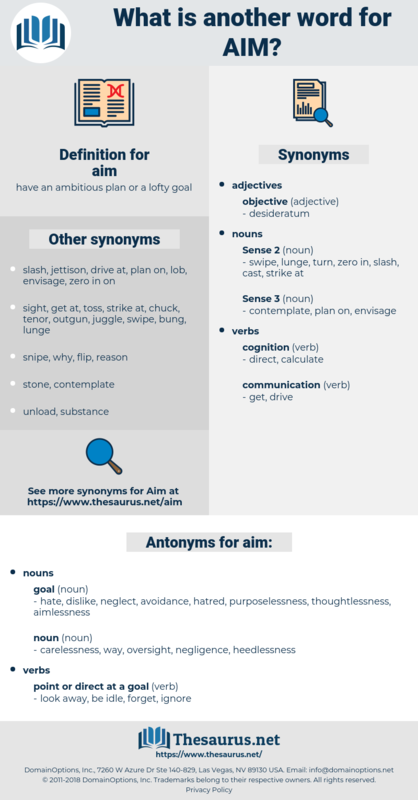 are, AM, Drank, aspire, intend, target, Purporting, endeavour. intends, strives, endeavours, attempts, contemplates, Focuses, focusses, plans, commits, purports, pursues, deals, covers, targets. lay, focusing, aspire, intend, target, endeavour, Addresses, meta. hate, dislike, neglect, avoidance, hatred, purposelessness, thoughtlessness, aimlessness. carelessness, way, oversight, negligence, heedlessness. look away, be idle, forget, ignore. Perhaps after all we should consider Ireland the end and aim of all things. The chief aim is to keep the part without skin from the air. anon., anna, ayin, anemone, anoa, aeonium, annwn, Anne, amino, ammine, anu, anyhow, annum, ane, amenia, ammino, ANON, anew, amoy, amine, anonym, ana, anime, A'man, amnion, annona, a-one, awn, anima, amnio, ammonia, amman, ammo, a.m., amah, aeonian, Aime, amen, an, Aum, anaemia, anyway, Ano, amon, anhima, ammonium, annam, anomie, Ame, anomia, ammonium ion, ain, Anomy, annoy, AMUN, any, awny, AM, ani, amia, anion, aeon, anaheim, anemia. sake, idea, view, will, mind, cross-purpose, final cause. level, swing, charge, hold, direct, target, aim, sight, place, draw a bead on, turn, point.